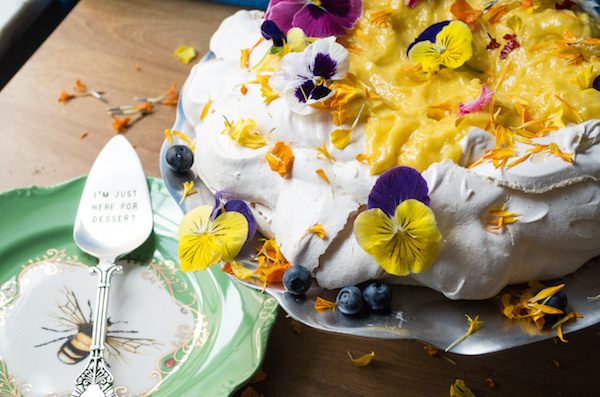 Pavlova is one of my favorite desserts to make because it is are so versatile and pretty, not to mention very easy. 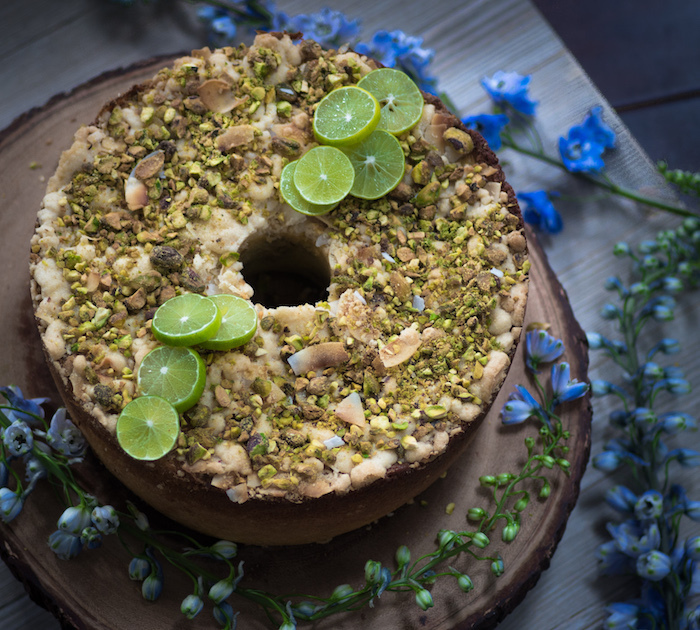 If you are unfamiliar with this treat, it begins with a base of meringue (with sometimes many layers), which is crunchy on the outside and soft inside. 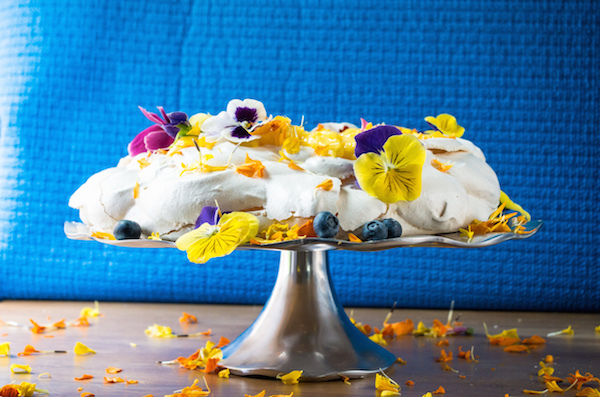 The meringue is typically topped with whipped cream, mousse, berries, curd or whatever your imagination can dream up. The meringue can also be flavored, chocolate is a popular option. 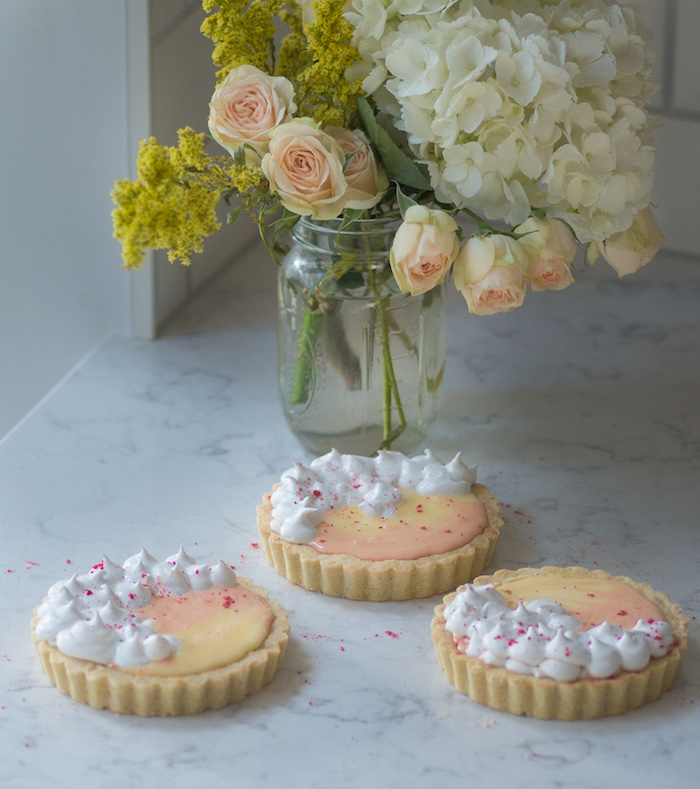 I was needing some lemon curd in my life, so I decided to stick with the traditional meringue flavor and decorate with edible flowers. This combo works great because you use egg whites for the meringue and egg yolks for the curd; it always bothers me to waste one or the other. I used Alton Brown's recipe for the lemon curd because I have found it to be the best so far. 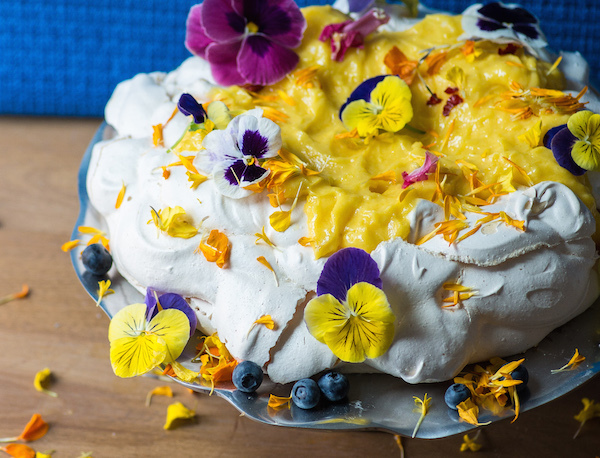 Recipe for pavlova topped with edible flowers. Beat egg whites and sugar until soft peaks form, then combine vinegar, cornstarch and vanilla in a small bowl, stir, then add to fluffy egg whites and beat until glossy peaks form. 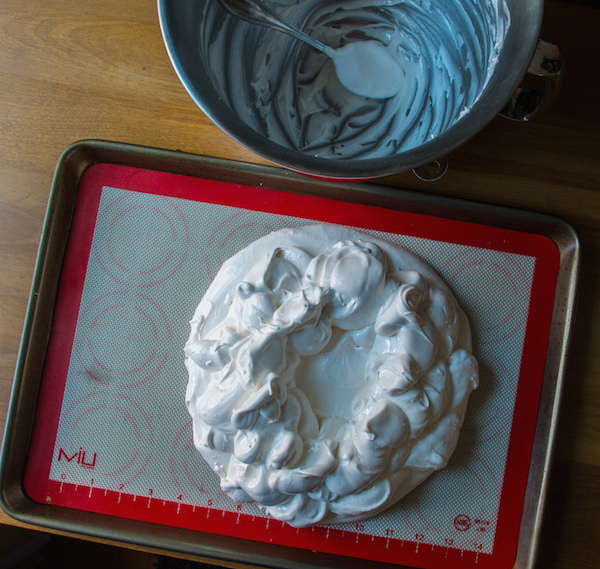 On a lined baking sheet, pour meringue in the shape of about a 9" circle, mold into circular shape with a rubber spatula, leaving a bit of a well in the center. Transfer to oven and bake for 1 hour and 15 minutes. 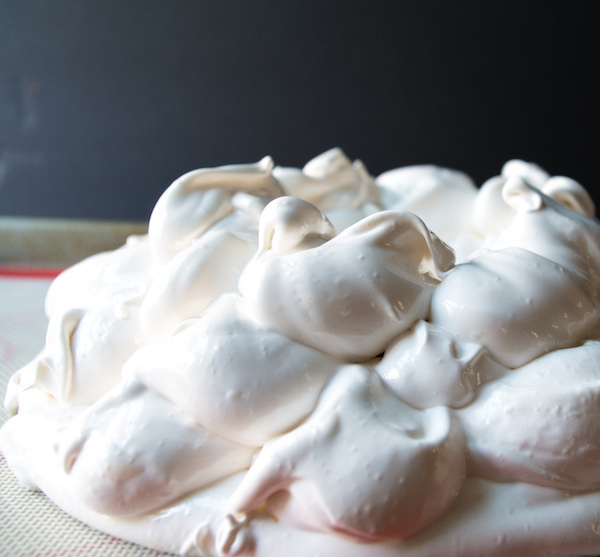 Turn off the oven and leave meringue to cool for at least an hour. This step is very important to prevent cracking. Set-up a double boiler (I use about an inch of water in a pot with a bowl that fits nicely but does not touch the water). Bring water to rapid simmer. 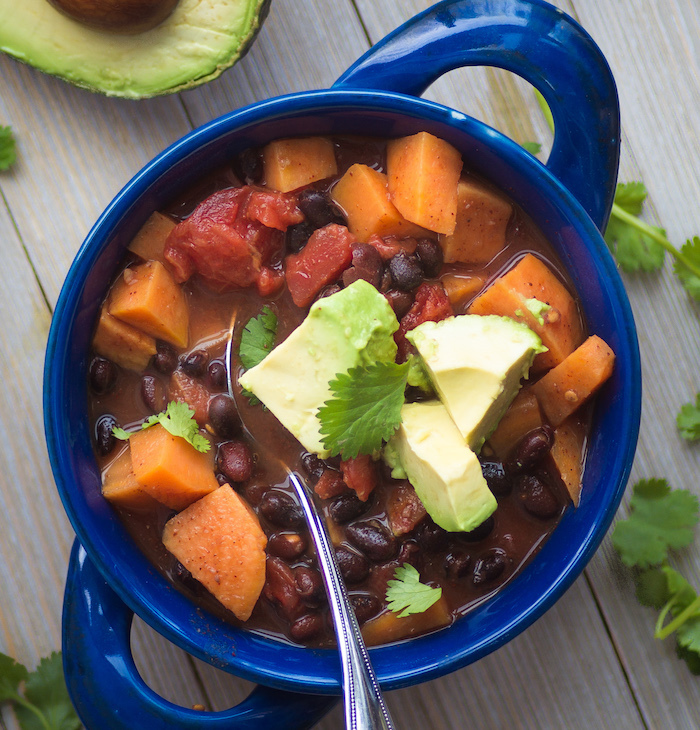 Beat eggs and sugar for about a minute, add zest 1/3 of the lemon juice and whisk until mixed in, then place bowl over simmering water and continue to whisk until it begins to thicken (8 minutes). Remove from heat, grab butter pads from the fridge and add one at a time, whisk each pad until it has completely melted before adding the next. After all butter has been mixed in, cover with saran wrap (place directly on curd) and put in the refrigerator. Prepare whipped cream with the heavy whipping cream as indicated on carton. 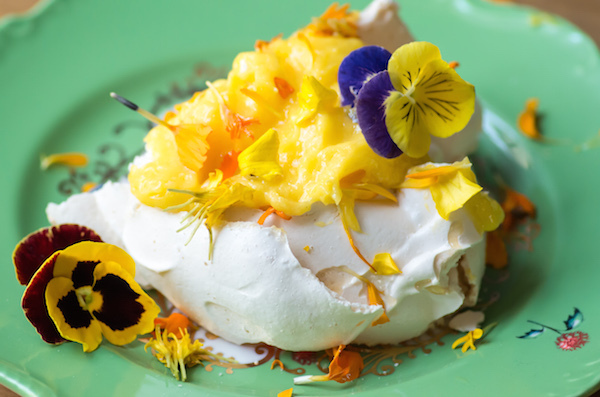 Place meringue on serving dish, fill with desired about of lemon curd and decorate with flowers. 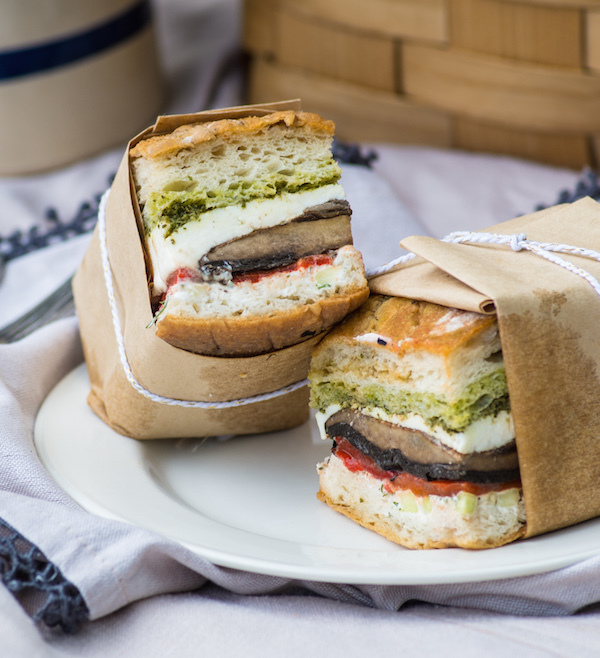 Serve with side of whipped cream.